Do you make clothes for your little dog? No,I never make clothes for him.You know,it is so small,and looks difficult.Dog's hands are not on body side,but in front of their chest. 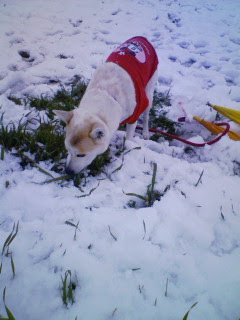 Yes,dog's clothes are expensive.But the red one in the picture is only 1000yen,because it is very simple,no bottons,no pockets.In cold days,it's enough. My dog only wear clothes in winter when he go out.